Softest sheets ever! These are like the ones you'd find in a 5-star hotel! My daughter had to buy a set as she liked mine so much. 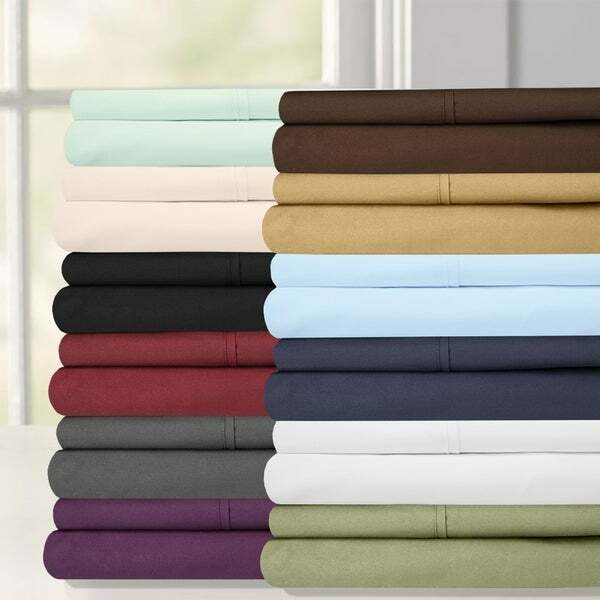 This lovley sheet set is available in a host of colors, all with a solid print on brushed microfiber. This sheet set is conveniently machine washable as well as beautiful. I can't always find sheets that our soft and come in dark colors. I purchased sheets in dark purple king size. the sheets fit good and very comfortable. No pilling after washing. Great sheets at a good price. I highly recommend them for a good sleep. We were looking for sheets that were soft right out of the gate. In the past, we purchased high thread count sheets thinking they were "better" and they feel like tarp on your skin. These are awesome. When they arrived, we wondered if they would hold up -- feel kind of skimpy but the comfort of the softness won out. They washed beautifully and we are going to order another set. Love them! I needed a navy sheet set. The sheets are very soft and I will order another set. These sheets are soft and silky. They stay cool at night which is what we were looking for. We bought white, so I can’t really comment on if the others are true to color. They have elastic on the corners that keep they snug on the mattress. Our mattress is about 14 inches deep and these fit well. I doubt hey would fit much deeper than about 16 inches. These sheets are soft, and wash Wonderfully!! It felt so good crawling into them. I would Def buy more! These sheets are soft, don't pill and fit thicker mattresses. I have a queen sleep number bed plus a 2-inch foam topper, and these sheets are deep enough to fit and tuck securely under the bottom of the mattress. If anything, I wish they were a bit thicker material, but overall, a great product! I searched for years for a set of sheets that were as soft as my old ones. I found some but have been paying close to one hundred dollars a set. I decided there had to be soft sheets for less than that. This sheet set is so soft and smooth and comfy! I also have washed them and they come out wrinkle free and like new. No pilling or scratchy feeling at all. They also fit the bed better than the more expensive ones. These are not thick material like stiff percale, but a very soft sheet. Looks wonderful under the white duvet and pillow shams. Very pleased. I will be ordering more. Definatly recommend. So comfy! Love these sheets on my king size bed so much I bought some for out daybed and guest bedroom as well. They wash up great and retain their softness. Love that they include more pillow cases than most sheet sets do. Will purchase again. I love theses sheets they hold up well and are very soft. Not as soft as expected but good quality for the price. Great sheet for the guest room. Great quality texture and very comfortable deep pockets that stay on great. Love the color also. Refreshing come from lying on something so soft. Just like Washing your clothes and using fabric softer so made it soft that to laid on. Great look , great feel , easy to sleep on , doesn’t slip or slide on the mattress cover . Good selections . I purchased the sheet sets for my son who is too busy to shop and he was very happy with the colors , especially the black set . His bed has that manly look now . These sheets are super soft' wrinkle free but they are starting to loose shape after just 3 washings. I love the softness and the color of these sheets. I also prefer to buy sets of sheets that give the extra two pillowcases as we each sleep on two pillows. Increadibly soft. We love this set!! "What's the thread count for this set?" Not sure but the sheets are very soft and comfortable. The color is vibrant and they wash well and maintain the softness. I am not sure the thread count. They are tencil--very soft, but don't know how long that they will last. "I am looking for a queen fitted sheet that does NOT have deep pockets." These have deep pockets. They fit pillow top mattresses very well. It's a good price and I like the fact that it came with 4 pillow cases, I always have to order an extra set when I get sheets. I needed a new sheet set for my new comforter set.